* Unique in the world medicinal water- anti-aging, pain-relieving thermal water therapy * Breathing therapy for many body or mind challenges. * Individualized Yoga and Movement Medicine options. * 2 Bodywork sessions * Ayurvedic consultation with Dr. Indunil of Sri Lanka. Includes live blood microscopy with diet and herbal supplement recommendations. The wholesome, therapeutic food and herbal offerings from La Finca Abundancia are unsurpassed in quality and healing anywhere on the planet! Your participation in this retreat experience promotes poison free, sustainable agriculture that is being demonstrated at our home, La FincaAbundancia. 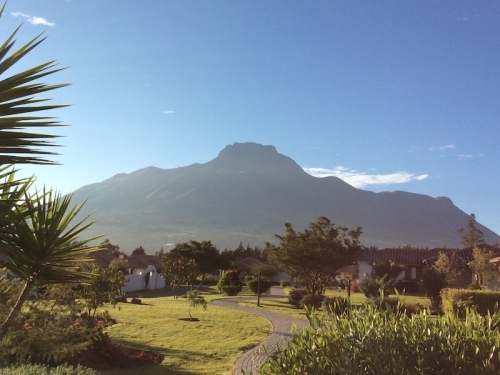 Transport to & from airport ** 8 nights in the pristine, natural surroundings of the Inbabura region of Ecuador. Elevation: 8,000 ft.